I went with Star Wars, reviving my idea for a Knights of the Old Republic campaign in which Darth Revan was succeeded by a Sith Empress. So far, all of these planets are from the Expanded Universe with no completely made up additions of my own. This is the most interesting region of the Galaxy in my opinion, where you get the Republic, the Jedi, the Sith Empire, the Hutts, Czerka Corp, the Mandalorians, and Adascorp, and can easily add in the Exchange. It has the homeworlds of the Arkanians, Cathar, Ithorians, Mandalorians, Miraluka, and Wookiees, which are all prominent races in the Old Republic; and also Gand, Trandoshans, and Weequay. Aside from Twi’leks, Duros, and Rodians, what else could one ever want? And those all have hyperspace engines. The only other equally interesting region of the Galaxy is the one that holds Tatooine, Bothawui, Rodia, Ryloth, Sluis Van, and Sullust (and Geonosis, Kamino, Mustafar, and Naboo if you’re into that stuff). 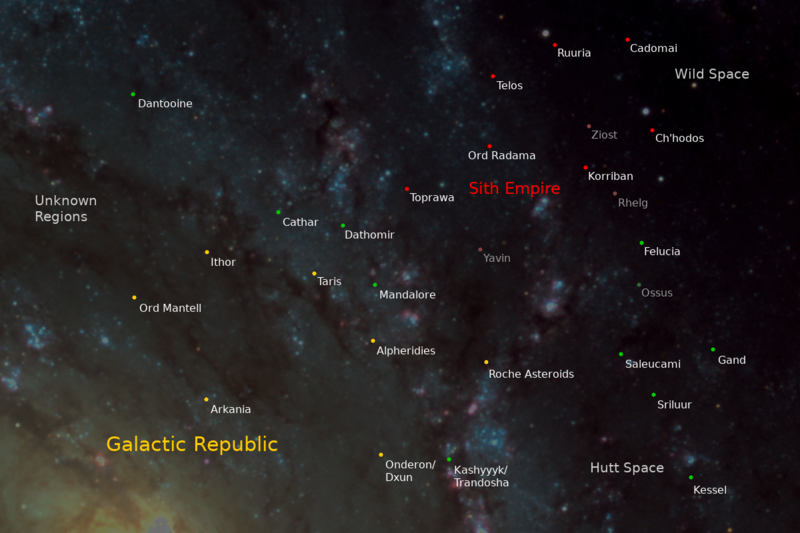 In a Rebellion campaign I would probably set my game there, but for the Old Republic there’s no space like Sith Space. But why limit yourself to a small part of the galaxy at all, when the movies very clearly make it look like you can jump from one end to the other in maybe an hour? Because if you give the players a map of the entire galaxy, it’s just way too much information. With a hyperdrive, the players can go almost anywhere at any time, and when every planet is an option, they are easily paralyzed by indecision and you have no way to have at least a little note card with the basic information at hand. Now where did I put my dice…? Finally main season at work has come to a close. Instead of 44 hours per week I am now down to a much more cozy 35 hours, and also almost no weekend duty anymore. That provides me with a lot more free time. And immediately I start thinking about starting a new online campaign. The biggest question is what type of campaign I want to make it. 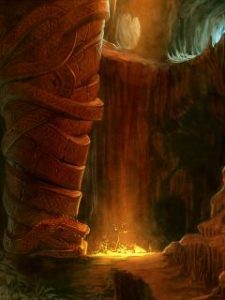 Some kind of Conan-style adventures in a Morrowind-style setting using material from my previous games, or do the Knights of the Old Republic game I had wondered about for a long time now. Now that I think of it, the question can probably be boiled down to “Do I want lightsabers or not.” The rest would actually be mostly the same. Considering all the options, I am currently favoring Barbarians of Lemuria as the game of choice. It doesn’t have all the numbers and restraints of D&D type fantasy games, but it also is mechanically really simple and easy to understand, which makes it very well suited for online play. Author YoraPosted on 05/06/2018 Categories Conan, rpgs, Star Wars1 Comment on Now where did I put my dice…?